The Town of Vestal is a diverse community in the southwest corner of Broome County, in the Greater Binghamton area of the Southern Tier of New York, protected by the Vestal Volunteer Fire Department. Originally founded in 1921, the Vestal Volunteer Fire Department is an all-volunteer firefighting force made up of your friends, neighbors, and co-workers, who work together every day to protect the 28,000 plus residents, and the thousands of visitors who work in and pass through the 52.5 square miles that make up the Town of Vestal, from fires and other emergencies. The Town of Vestal Fire District is comprised of rural areas, extensive single family residential dwellings in suburban settings, multiple occupancy apartments, townhouses, garden apartment structures, industrial facilities, churches, schools, nursing homes, medical facilities, business/office buildings, commercial and retail centers, malls and complexes, and includes the SUNY-Binghamton University Main Campus, the Binghamton-Johnson City Joint Sewage Treatment Plant, and several petroleum tank farms that serve south-central NY and northeast PA.
Our four fire stations are strategically located throughout the Town, currently staffed by our 136 members; Station #1 on North Main Street in the 4 Corners area in Central Vestal, Station #2 on Route 26 in Vestal Center, Station #3 on Owego Road in Ross Corners, and Station #4 on the Vestal Parkway in the Willow Point section of Town. The Stars on the map indicate where the four stations are strategically located throughout the Town of Vestal. 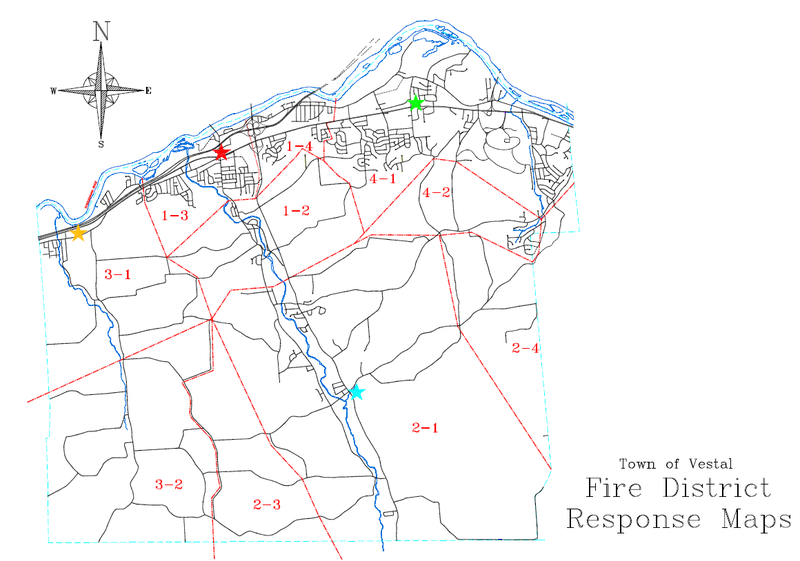 See full fire district maps document by clicking here. Each station is equipped with apparatus to handle the emergencies in their respective districts, as well as assisting the other stations. Station #1 has an Engine, 70’ Tower, Heavy Rescue, command vehicle, Brush Truck, and Rescue Boat. Station #2 has an Engine, Midi Pumper, 3000-gallon Pumper Tanker, Heavy Rescue, Brush Truck, Traffic Control Trailer, and an ATV and trailer equipped for brush fires. Station #3 has an Engine, Midi Pumper, 2500-gallon Pumper Tanker, Utility vehicle, a Rescue Boat, and an ATV. Station #4 has an Engine, a Foam Truck, a 104’ Tower, a Utility vehicle, an Air Trailer, a spill trailer, and 2 foam trailers. Each Station Chief, and the Department Chief, are assigned Chief’s Vehicles, and a Training Van is also available for use by FD members for attending training schools. The Vestal Volunteer Fire Department is funded solely through taxes collected from Fire District taxpayers. The proposed operating budget for 2019 for the Vestal Fire Department is $1,406,514 for a tax rate of $0.7346 per $1,000.00 of assess value. This would be $73.46 tax on a $100,000.00 home. 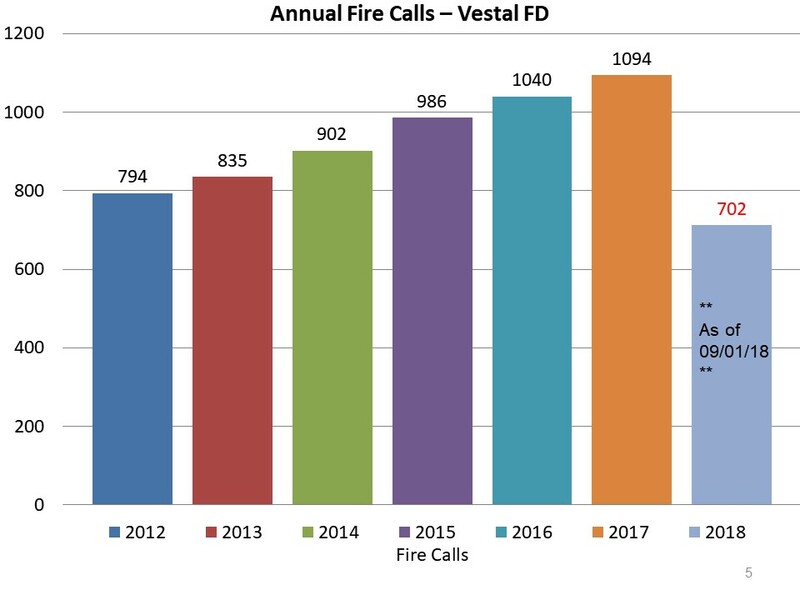 The Vestal Fire Department is very proud to the fact we have kept our costs fairly flat over the years, and when you look at our proposed 2018 – 2019 budget, we have worked very hard in planning for the future to keep the Vestal Fire Department operating at the highest level, while keeping the cost impact to our residence to a minimum! As you can see the Vestal Fire Department is very busy answering the call of duty. Today, the Vestal Fire Department’s strives to provide our Town of Vestal residents with the best fire protection, with the biggest bang for your hard-earned dollar. The members of the Vestal Fire Department greatly appreciate our citizens support, and look forward to serving the community for many years to come! We are always in need of new volunteers! We have a job for everyone! For more information on the services we provide, please see our services page.